The NI AWR Design Environment is highly customizable. Common types of customization include creating custom hotkeys, custom toolbars or menus, using scripting to automate repetitive tasks, and changing the NI AWR Design Environment appearance, docking workspace, or toolbar locations. More advanced customization can include creating custom parts libraries or adding custom models and parameterized layout cells. Click on the links below to test drive the most common types of customization. More information about creating custom parts library is available in the NI AWR documentation. Contact your local NI AWR sales rep or NI AWR support for more information on adding custom models or parameterized layout cells. 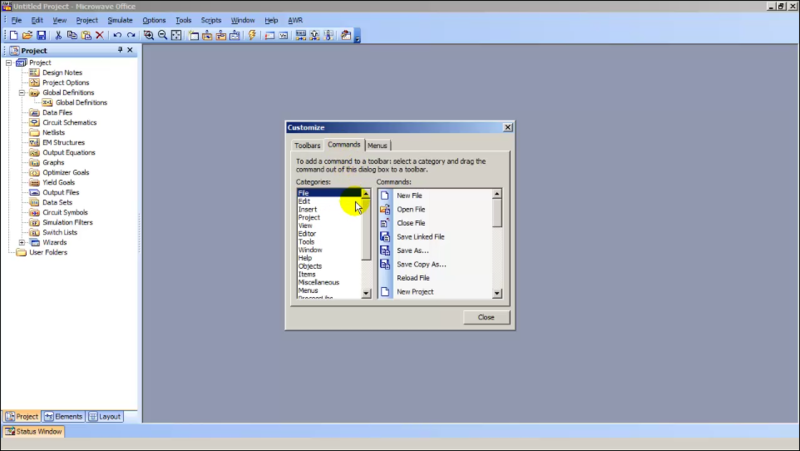 This video will show users how to customize the user interface in MWOffice, such as adding toolbar buttons, adding menus and menu selections, and customizing hotkeys. The NI AWR Design Environment ships with many default hotkeys for common commands such as copy (ctrl+c), paste (ctrl+v), and simulate (F8). It is easy for users to define new hotkeys or re-map existing ones using the customization tools. This simple customization makes the environment more personalized, intuitive, and increases efficiency. See the hotkey documentation to learn how to start your own hotkey customization or click on the button below to try a few custom hotkeys. The NI AWR Design Environment supports creating custom toolbars and menus. Much like custom hotkeys this simple customization makes the environment more personalized, intuitive, and increases efficiency. See the custom toolbar and menu documentation to learn how to start your own toolbar and menu customization or click on the buttons below to try a sample custom menu or custom toolbar. Note that the custom toolbar gets added to the bottom of NI AWR Design Environment Window but can be moved to the top if desired. The NI AWR Design Environment supports automating tasks in the environment with the use of scripting. Creating custom automation scripts is straightforward and users can get started with little programming knowledge. Custom automation really personalizes the design environment and allows users to streamline their design flow and spend as much time as possible focusing on the design rather and driving the design software. The getting started with automation documentation is a great resource for developing your own automation routines. Click on the button below to try a sample automation routine that re-formats all the Graphs in a sample project. Subsequent button pushes toggle between two different Graph view settings. The NI AWR Design Environment supports adding in custom compiled utilities written in programming languages such as C++ or VB .NET. This allows engineers to write design utilities that can interact with the AWR Design Environment while using the most efficient language for the task. The built in scripting language is great for automating tasks within the AWRDE but other languages might be more suitable when solving more complicated problems. Click on the button below to open a project that has a wizard called wizardTemplate to run. This simple wizard was coded in VB.NET and makes an inventory of the contents in a project. In addition to the different types of customization mentioned above, the NI AWR Design Environment supports customizing colors, fonts, symbol appearance, themes, window behavior, etc. See the custom appearance and workspace documentation to learn about all the different options and settings available. Click the button below to clean up all the sample customization used in the sections above.